The Peppa Pig 4 in 1 Shaped Puzzles is a set of brightly coloured jigsaw puzzles which every child will enjoy piecing together. The four shaped jigsaw puzzles each features characters from the popular children’s programme. Each of the four jigsaw puzzles have a different piece count, which is designed to help children progress building their skills and confidence in making puzzles – to be able to enjoy larger pieced jigsaw puzzles. There is a 3, 6, 9 and 12 piece jigsaw puzzle in the box…. This toy costs approximately £6.99 (for the latest and best prices make sure you check our retailer list for the Peppa Pig 4 in 1 Shaped Puzzles above). 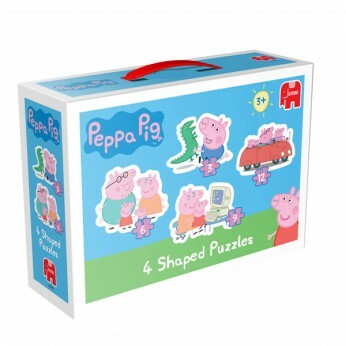 In our review of Peppa Pig 4 in 1 Shaped Puzzles we classed it as being suitable for ages 3 years, 4 years, 5 years but recommend you check the manufacturer specific advice before purchasing.